Summer is upon us, and if you have some vacation planned in the next few weeks, you’re probably starting to prepare for it. If you are bringing your Labrador along with you on vacation, there are a couple of things you should keep in mind as you travel. 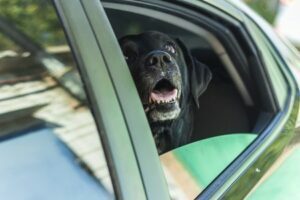 If your lab isn’t use to traveling long distances or in a car on a frequent basis, they might be anxious throughout your journey: it’s best to get them acclimated to longer car trips before you set out on your trip. About a month or two beforehand, start taking your dog for longer car rides and increase the length incrementally. Labs can be prone to anxiety in unfamiliar situations, but eventually, they’ll be just as comfortable in the backseat as they would be at home. The safest place for a dog to ride in the car is in a crate. If a dog is lying on the backseat or sitting in the front, they might distract you resulting in an accident. Dogs are also prone to get injured in cars if they are not secured. Although crating a Labrador requires a decent size crate, you should consider doing so in order to protect all passengers and your pet. Keep in mind that a lab should be able to comfortably walk in a circle, sit, and lie down inside of a crate. If you have to pull over to use the bathroom, chances are your dog does too. Do a little research before hitting the road and take note of some pet-friendly rest stops so that you and your Labrador can take care of business. Make sure to exercise your dog frequently during the trip as well, they need to stretch just as much as you do. Make sure to pack enough food as well for your dog and don’t forget to bring a water bowl. Stop as needed to allow your dog to eat their food and get a steady drink. You should always have any dog related documents with you when traveling with your pet. Whether they have a medical condition, take a medication, or have diet restriction, make sure to have medical proof in the event that you need to visit an emergency vet. Even if your dog does not have any health issues, you should have proof of vaccinations, shots, and so forth. Looking to take a road trip in order to meet your future British Labrador? KT British Labradors proudly serves residents throughout Minnesota and beyond.